The combination of an active lifestyle and a nutritious diet continue to be one of the best prescriptions for a healthy, long life and play a key role in maintaining cardiovascular health. The Mediterranean diet (not a single plan but more of a general style of eating) is rich in many heart-healthy nutrients including fruits, vegetables, fish, and olive oil. An analysis of six studies reported that use of the Mediterranean diet improved cardiovascular health to a greater extent than the standard low fat diet (Nordmann 2011). Olive oil contains a healthy mixture of fatty acids and important anti-oxidant compounds such as hydroxytyrosol. Numerous animal and human studies have reported that regular consumption of olive oil is associated with many different kinds of benefits for cardiovascular health (Hu 2014). Nuts, including walnuts, almonds, cashews, hazelnuts, Brazil nuts, soynuts, and peanuts. Nuts contain a wide range of nutrients including protein, omega 6 fats, fiber, vitamins, and minerals. Some nuts and seeds such as flax, almonds, and walnuts are also a good source of omega-3 fats. At least 5 large published studies have reported that consuming a serving of nuts several times a week is associated with significantly lowered risk of heart disease (Hu 2002). Apples are rich in fiber and contain phytonutrients such as flavonoids. One study linked higher consumption of apples with significantly lower risk of heart disease in postmenopausal women (Mink 2007). Green tea contains a wide range of antioxidants such as flavonoids and catechins. A recent Chinese study linked consumption of 3 or more cups of green tea daily with significantly lower risk of heart disease (Pang 2015). Red wine and red/purple/black grapes contain a wide assortment of phytochemicals such as resveratrol- a strong antioxidant. Several studies have linked higher consumption of red wine and or dark grapes with lower risk of heart disease (Mink 2007). Try adding more of these heart-healthy foods to your diet. Aside from being tasty, many are rich in nutrients, fiber and healthy fats!. A good diet, along with proper food supplements, sufficient exercise and avoiding smoking and toxins can go a long way to building optimal cardiovascular health for a long and active life. Hu FB, Willet WC. 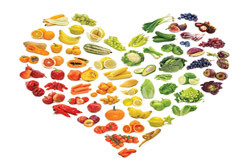 Optimal diets for prevention of cardiovascular disease. Journal of the American Medical Association 2002;288:2569-78. Hu T, He XW, Jiang JG, Xu XL. Hydroxytrysol and its potential therapeutic effects. Journal of Agricultural and Food Chemistry 2014;62:1445-9. Khurana S, Venkataraman K, Hollingsworth A, et al. Polyphenols: Benefits to the cardiovascular system in health and aging. Nutrients 2013;5:3779-827. Mink PJ, Scrafford CG, Barraj LM, et al. Flavonoid intake and cardiovascular disease mortality: a prospective study in postmenopausal women. American Journal of Clinical Nutrition 2007;85:895-909. Nordmann AJ, Suter-Zimmermann K, Bucher HC, et al. Meta-analysis comparing Mediterranean to low-fat diets for modification of cardiovascular risk factors. American Journal of Medicine 2011;124:841-51. Pang J, Zhang Z, Zheng T, et al. Association of green tea consumption with risk of coronary heart disease in Chinese population. International Journal of Cardiology 2015; 179:275-8.